VIPRE packs a lot of features into a very clean package. Scan times can be long, but the proprietary RapidScan cuts those down and makes VIPRE more usable than its direct competitors. Pricey for single-computer users, but a good option for multi-computer coverage. VIPRE Antivirus, from VIPRE Security, is a very solidly constructed, well-thought-out antivirus program. The company borrows some of the best features from more well-known programs on the market (Kaspersky, Norton, AVG, etc. ), while also throwing in a fair number of unique services and tools. VIPRE antivirus has a 30-day free trial, a low-cost yearly subscription plan, and avoids gimmicky or user-unfriendly practices that are increasingly common with some programs on the market. Reader deal: You can save 30% with this link and by adding the discount code “COMP30VAS” at checkout. Alongside that, AV-Comparatives has found that VIPRE Antivirus has over 99 percent detection rates and minimal false alarms, especially when compared to more well-known options like McAfee, Symantec, and Trend Micro. Experience tells us that you can measure a software company by its signup and installation process. VIPRE Security is very transparent throughout this whole process and minimizes as many roadblocks as possible to buying the program (or getting the free trial) and installing the software. VIPRE Security clearly explains what you’re paying for when you purchase VIPRE antivirus. The price is indicated as a yearly subscription fee. There are two additional services you can purchase as part of the package — coverage for phones and a backup CD. The additional mobile device coverage costs $9.99/year for a single device, while the backup CD costs $9.95 as a one-time payment. They don’t come pre-selected on the purchase screen. You have to add them separately if you want them. The cost for one computer is $54.99 per year. You can choose to cover more computers at a higher subscription fee. You can cover up to 3 computers for $10 extra ($64.99), up to 5 computers for $20 more ($74.99), and up to 10 for $45 more ($99). On a strictly per-computer basis, the 10-computer plan is the best value as it essentially prices out at $10 per year, per computer. The 10-computer option is a good value if you’re running a small business, especially given the business version of the software is $24 per year per computer for 5 to 249 computers. Do note, however, that the business version does have some features not found in the home version, so there is a bit of a give and take. Save 30%: Our readers can save 30% on the above prices by using this link and by adding the discount code “COMP30VAS” at checkout. Additionally, VIPRE will work with Android, although VIPRE Security does not mention which versions of Android it will or will not work with. On the Google Play store, the Android version of the program does not identify which version of Android you need to make it work, either. To discover more detailed information about this, I had to email customer support. VIPRE Mobile works with Android Version 4.4 or above. The signup and installation process for VIPRE was fairly easy. Positively, VIPRE avoids suspicious sign-up and purchasing schemes that result in users accidentally tacking on unwanted or undesired services. Instead, when you go to choose the home version of the product you’re given just the software, with the option to select two potential add-ons (a backup CD and a subscription for the mobile version). That’s it. Once you purchase your product, you’re given a product key that you’ll need to put in after downloading the program. If you get a message upon download that says the program may be harmful, ignore it. In my case, the program came up as “potentially harmful” as well, but this has everything to do with my current virus protection acting overly protective. Competing virus software programs will often misidentify other virus programs as potentially harmful. Opening the program requires you to input the product key. After you input the product key, installation may take several minutes as the program downloads and installs onto your computer, which includes updating to the latest virus definitions. VIPRE will also perform an initial “first scan” at the end of the installation process. In my case, the installation process took about 30 minutes, most of which was likely due to the initial first scan. After downloading and installing VIPRE, you’re effectively set up and ready to use the program. Some settings are already in place that you might want to change, such as scheduled scans, automatic scanning, frequency of automatic quarantine deletions, and scanning behavior. If you’ve used Zemana, Norton, AVG, or McAfee, the VIPRE interface won’t be too dissimilar. Most of the higher-quality virus programs have fairly simple interfaces, in fact, going more for a utilitarian style. That said, the interface for VIPRE is clutter-free, and the ease with which you can navigate to the things you want is very intuitive. You’ll find three main sections in the program cycle through: MyVIPRE, Account, and Manage. MyVIPRE is where you’ll find the scan and scheduling features, as well as access to your scanning timeline to see what previous scans revealed. You also have a notifications section that lets you know whether your firewall is on, whether there have been any definition updates, and when your next scan will be (and how long ago your last scan occurred). The Account section is where you’ll find your subscription status, product key, and faster access to help and support. You also have the option to change your background theme here, which is quite possibly the least useful option available. The color schemes aren’t very impressive. There’s a good chance you’ll cycle through them and just go right back to the preset scheme. The third section in the interface is Manage, where you’ll find all of the security features. Here are sections for Antivirus, Updates, Email, Firewall, and Privacy. To avoid being redundant, we’ll give these features a more detailed overview later in this review. VIPRE has some expected security features, as well as some that were brand new to me. As with most antivirus software programs, you can perform both full, quick or custom system scans, and you can schedule your scans for certain intervals. The program comes preset to perform a full system scan on Sundays at 10:00 PM, and a quick scan every day at 10:00 AM. You can delete these, or keep them and add in new scanning schedules. The scanning schedule can use one of three different scan types, time of day, and time of the week. You can also give the scan a name. Deleting scheduled scans is accomplished by right-clicking on the scan and hitting delete from the pop-up menu. This was not immediately obvious, and I can imagine a world where someone may not realize how to delete the scans, causing a lot of frustration. To better aid users, it may be wise for VIPRE Security to put a delete option into the menu window for scheduled scan editing. 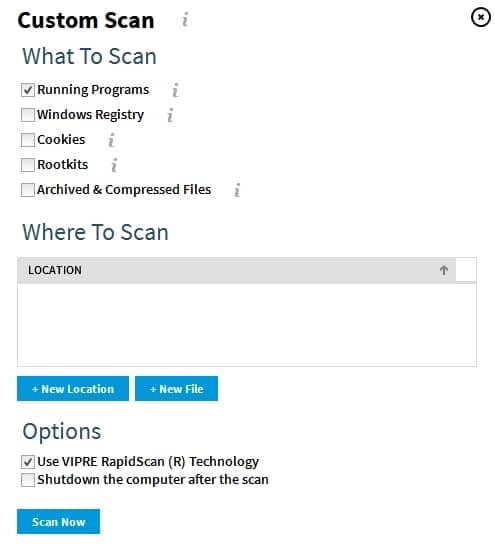 VIPRE Antivirus also offers what they call their VIPRE RapidScan Technology. According to the description, this feature will “only scan files that are new or have been modified since the last scan.” I actually found this feature to be incredibly useful and time-saving. Having to rescan every file, even if it hasn’t changed or isn’t new, can be tedious, especially if you have a large file system. After scanning you can choose to quarantine files or delete them. VIPRE antivirus includes some “advanced” protection methods, including the option to scan files when they are opened or copied. You can also choose to just scan individual files on-demand using the custom scan. I put the different scanning options to the test for this review. Part of the reason for testing scans is to determine how much of an impact scanning will have on system resources. 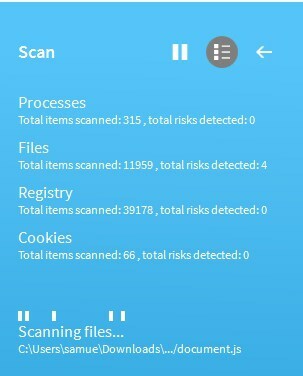 Scans can sometimes be pretty disruptive, and some antivirus software will eat up so many system resources during the scanning process that the computer becomes unusable. This is especially so for computers that already have limited resources due to a lower-quality processor and chipset. As you can see, the system itself is not particularly powerful to begin with, so for a computer with limited resources like my test computer, I would almost certainly need an antivirus program that won’t eat up my resources. VIPRE Security claims that their VIPRE software “doesn’t slow down your PC.” My assumption is that this claim is made for any computer that meets the system requirements (which my netbook met). A test on all of the scanning options is a viable way to test that claim. The system usage numbers tend to fluctuate even when not running system scans, but will spike to higher numbers when performing scans. I gave a general range for most of these, as well as a “high” number for the scans. I also downloaded an inert EICAR test virus to determine if the scans would pick up viruses, and used a live virus sample in a closed system test environment to determine if VIPRE could pick up and clear real viruses as well. The quick scan results were interesting. VIPRE easily found the EICAR test virus on my system. While the scan took far longer than what I would call “quick,” at 25 minutes it wasn’t the longest I’ve experienced for a quick scan either. Scan times will always vary for different computers, so I consider this to be somewhat within reason for the computer I used for testing, although almost certainly on the high end for being called a quick scan. Nevertheless, the length and number of areas checked indicate that the VIPRE quick scan was plenty thorough. This was my first time encountering such a message, which again seems to indicate that the quick scan is fairly thorough in and of itself, but also was my first indication that the full scan was going to be very meticulous (read: time-consuming). With my already limited system resources, the quick scan caused some significant system disruptions. Not so many that my computer became unusable, but loading programs and web pages slowed down significantly. I can imagine someone could get frustrated pretty quickly if they didn’t know the system scan was scheduled and running in the background. As anticipated, the full scan took much longer and was far more thorough in the number of files scanned. In fact, the full scan poured over more than 43 times the number of files as the quick scan. Thankfully it didn’t take 43 times as long to perform the scan. At an hour and 45 minutes, I felt that the VIPRE full scan was reasonably long for a full scan. What I did notice was that the scan used up a noticeably larger amount of system resources, although not so many more that the system impact was different than what I experienced with the quick scan. I tested the schedule scan feature using a quick scan with the RapidScan technology turned on. The purpose here was twofold: to see if the scheduled scan worked, and to see if the RapidScan worked. The scheduled scan ran into a bit of a hiccup. I discovered that the scheduled scan will not run if the program is updating its virus threat definitions. You also cannot perform a scan manually when this occurs. The virus definition updates took several minutes to complete, which at the least gave me a chance to see if the scanning process would start automatically after the scanning lockout. Thankfully, it did. My scheduled scan took place eight minutes behind schedule. The scan had some interesting results. The most important of these is the fact that RapidScan reduced the scan time by more than half. This was primarily a “proof of concept,” in that the 12-minute scan time was much more palatable than the 25 minutes from the first quick scan. System impact was also not significantly different than a normal quick scan. The RapidScan did not pick up the test virus, however. 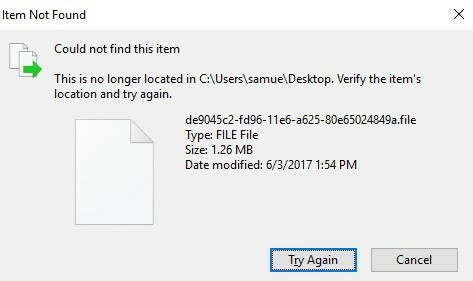 This may have more to do with the fact that the file was “unchanged” since the last time it was picked up by the scan, so there was no reason to identify it in the scan. For the live virus test, I used a sandboxed method on my machine. I employed the same method I used in our guide on malware removal and prevention, to great effect. Comparitech does not recommend downloading and testing real viruses if you are not a virus researcher or tester. These programs can cause significant damage to your machine and can spread in unpredictable ways if not properly tested. I installed several different malicious software files on my computer. Most are the kind you would run into if you accidentally clicked on a bad link, although it was a mixture of generic virus programs, trojans, and adware. I first ran a quick scan with the VIPRE RapidScan feature turned on. This was done to see whether the quick scan would identify the viruses, what it would do with them if it found them (.e.g., quarantine them, or give me a message saying I need to run a full scan), and to determine how well the RapidScan would work in a real virus scenario. The results were encouraging here. The scan was fast (17 minutes) and picked up three trojans. All were automatically quarantined. VIPRE gave me the option to move two of them from quarantine and either delete or allow them. I could also allow them permanently, a safety feature for if the threat that’s detected is not actually a virus. For one virus, VIPRE gave me no option beyond quarantine. I could neither delete it nor move the virus from quarantine. It was stuck there. I could, however, delete it in the more advanced management settings. Given that both quick scan (without RapidScan) and full scan are thorough, this test gave me confidence that VIPRE would find viruses fairly well. It may be your best interest to schedule a full scan without RapidScan once a week, and then any other scans during the week with RapidScan to cut down on scanning times and system impact. 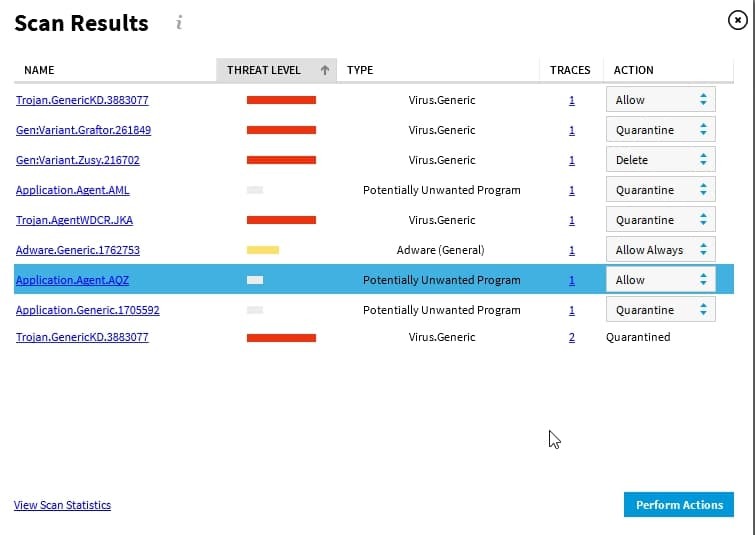 When viruses are located, a threat level bar indicates how serious the virus is. The colors are common here: red means very bad, while yellow is indicative of a virus that’s suspicious but not super troublesome. Gray indicates a file that’s likely not an issue, but just of possible concern. You are also shown the number of traces of that virus that exist on your computer, and the type of virus. 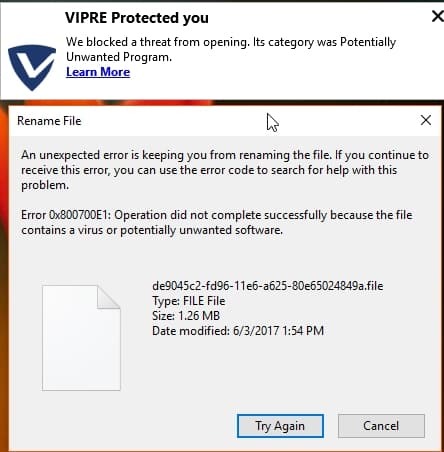 After choosing to delete the located viruses, VIPRE suggested I perform a second layer scan, which is just the full scan. I decided to perform the full scan to see whether the program would discover anything else. At times, viruses can replicate and hide on the system, so a good full scan should root those out. You can also turn on a “Quiet Mode” for the active protection. This simply takes care of those threats without notifying the user. You may or may not want to choose this feature, as the active protection can pick up on processes that aren’t actually malicious and close them against your wishes. This description sounds exactly like what it is. Edge Protection prevents users from downloading malicious viruses. I was able to download the live samples easily, as the files have been made inert, are zipped and are password protected, but active, malicious downloads and links get blocked. This is VIPRE’s standard web filtering, common with most virus software and even included in most web browsers now. This is nothing unique, and there’s a good chance you have multiple forms of this already working on your computer, especially if you’re using Windows. You can change the settings to allow some websites that tend to get blocked even if they’re safe. If you’re doing that in VIPRE, you’ll have to do it in any other site filtering programs as well, such as Google Chrome’s built-in filter. When you perform scans, or when other monitoring methods are active, you can set VIPRE’s behavior so that it either handles them automatically for you or lets you handle what happens to the files yourself. If you don’t trust VIPRE to handle the potential threats correctly (e.g., you keep getting files deleted that shouldn’t be removed), it’s best to turn this feature off. The program is fairly sophisticated, however, and it will usually only delete threats that are clearly malicious, while uncertain files will get quarantined. Firewalls are standard for virus protection these days. As with web filtering, there’s a good chance your computer already has a firewall in place. Keeping VIPRE’s firewall turned on is optional in this case. However, if you don’t trust the built-in firewall for Windows, it may be a good idea to use the more extensive VIPRE firewall. VIPRE can connect to your Facebook account and scan your Facebook timeline for malicious threats. You will have to log in to your account through the program, which does mean giving over permissions to VIPRE. Note that this does mean that VIPRE will have a lot of data on you through your Facebook account. If you’re particularly security conscious, go ahead and avoid this one. It’s a useful tool, but not one you’ll want if you want to limit who has access to your data. If you do decide to use Social Watch, you can set it to scan at regular intervals, such as every two hours. VIPRE also allows you to check up on the history of what Social Watch has been up to with its account access. See also: Our guide to Facebook privacy and security. As VIPRE Security states for this one: “Securely and completely eliminate any trace of files from your computer.” This is more than a simple delete to the trash can, and more than just emptying your recycle bin. What this does is delete the data, then overwrites the deleted data with nonsense information so that it can’t be recovered, even with advanced computer forensics. There are separate programs you can purchase with real money to do this for you or some that are free of charge. This is a real boon for those who want maximum privacy. 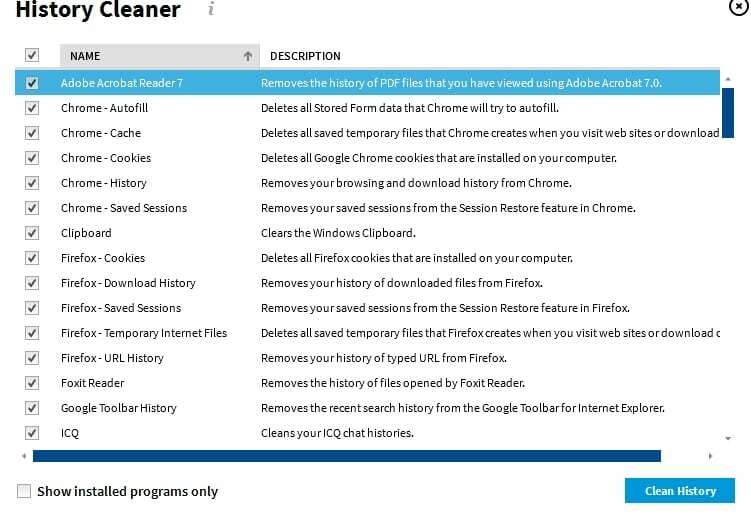 VIPRE’s History Cleaner is a simpler, quicker way to clean up your browsing history. It goes for the temp folders that often get ignored. It also deletes history files from all of your web browsers at the same time. VIPRE Security’s support is a bit frustrating. I, (like most people, I assume), don’t want to call customer support after having plenty of customer support horror stories. I prefer to use chat support when it’s offered. VIPRE Security offers chat support on their website, alongside email, a phone help system, support articles, and the now-standard self-help forums for the most common issues. What’s painfully missing from support is the option to search through the forums and “solutions” section for keywords. If you have a common issue, you have to do a lot of manual digging. The company relies a bit much on its forums, which are somewhat interesting, although useful insofar as you have to hope someone already asked your question and received an answer. Anyone can post a new topic. From looking at the forum posts, it does not look like VIPRE Security responds to all of the posts, or even timely on the ones that they do respond to. To be fair to VIPRE Security, many of the forum questions are not ones they can reasonably attempt to answer or are ones that could more easily be answered through a support ticket or using the chat system. That said, I tried to use the chat system to get a simple answer I couldn’t find anywhere on the site: “What is the Android operating system version limitation for the VIPRE Mobile app?” I opened up a chat support question for this, and after entering my name, email address and phone number (why do I need to give this away? ), waited about two minutes for an agent. After two minutes, the system booted me out, saying there were no available agents. Does VIPRE Security have certain hours of availability for the chat support? If they do, they don’t post them anywhere that’s obvious. I next chose to open up a support ticket. The support ticket required some basic information, including my phone number (again, why?). It also needed more detailed information about the operating system, software, and gave a place to write about my problem in more detail. I also had the option to label the priority of my ticket as “low,” “medium,” “high,” or “urgent.” Obviously, my question wasn’t entirely urgent, but who would actually choose anything other than “urgent” if it made an impact on how fast you get a response? I got a response less than 24 hours into the next business day. VIPRE Security states that most responses come within 24 hours, so this was in keeping with their stated policy. As far as help and support go, it seems VIPRE Security has some good systems in place but could make some basic information far easier to locate. Additionally, they should put whether they have set hours for their chat system and phone support. If there are none, then getting timed out from the chat support system because of no agent being available is pretty unhelpful. 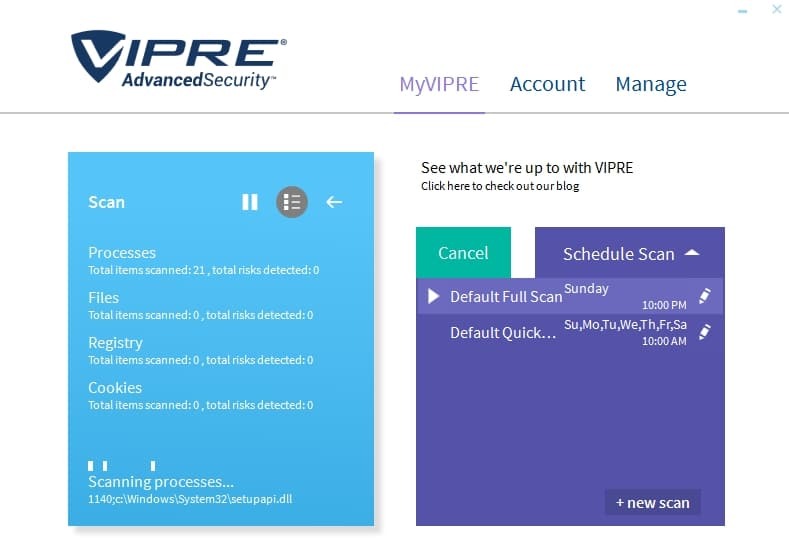 VIPRE’s large array of helpful tools makes this software a highly effective security solution. The scanning is extremely thorough, and VIPRE Security regularly updates its virus definitions. At present, there are over 58,500 virus definitions that the program can identify. It’s also designed to throw up warning flags at programs and operations that look malicious. Like most virus programs, VIPRE will give you the option to check these out individually in case of false positives. The fact that you can monitor pretty much everything with this software makes VIPRE an extremely effective, all-inclusive security tool. Tacking on a subscription for a mobile version of the program makes it significantly more useful for most consumers. AV-Comparatives isn’t the only independent testing lab to produce great results from VIPRE Antivirus. Alongside AV-Comparatives, this tool has been certified by ISCA Labs, the Info Security Products Guide, AV-Test Institute, and Virus Bulletin. I use Vipre. This is my second year and I am very happy with its performance. It was their customer service that caused me to use them in the first place. The reviews as to this aspect were very good from what I researched. I had Trend Micro for many years and when the price went up into the $90+ dollar range I had to change. Also, when I spoke with customer service with Micro I got India and could not understand that person at all. I had a problem with Chromium taking over my browser and many other things and it was impossible for me to remove. I put in a ticket with Vipre and got a response the next day. The English speaking customer service man accessed my computer and fixed it without a problem and was very patient with me as I am not too tech savvy. It was refreshing to deal with Vipre and I will continue to use this company.